We all know that in the event of a large-scale disaster, treated water supplying the greater Portland area may be compromised by damaged treatment plants or supply lines. It is important to stock up water for at least two weeks (1 gallon per person per day). Many people are acquiring large water containers (typically 55 gallons) and flushing them out 1-2 times per year. Depending on how clean the water container is, it might be necessary to treat the water to avoid any gastrointestinal illnesses that may occur due to bacteria/virus/protozoa growth, or even just to add peace of mind that what you are drinking is in fact safe. 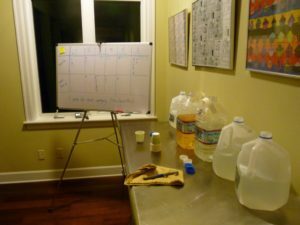 Four treatment methods were used on nine-month old tap water from a sterilized backyard storage container and water from Laurelhurst Pond. The pond water was only treated with the filter method for safety reasons, namely to remove particulates. All treatment methods left the water to stand at least 30 minutes before consumption, according to instructions. The purifier did not require any standing time, but it should be noted that filters and purifiers generally pump out water at a rate of 2 quarts per minute. Participants blind-tested each sample and voted for their favorite and least favorite. Least Favorite: Hands down the least favorite was the iodine method prior to neutralizing the taste/color. This sample stood out from the rest due to its yellow hue that reminded people of urine or apple juice. Favorites: The favorite was the purified tap water, followed by purified pond water. These samples had no discoloration and little or no chemical smell (unlike chlorine and iodine). Important! The purifier was the only method that physically removed potential harmful particles in the water rather than adding a chemical to denature any live bacteria/protozoa/viruses. But it’s important to note that a water purifier is different from a water filter, which does not remove the smallest particles (such as viruses). Not all systems are 100% effective against all life stages of protozoa. Cryptosporidium is a microscopic parasite that is naturally found in freshwater systems, including lakes, ponds, streams, and rivers. It is resistant to chlorine and other chemical methods. Boiling water for one minute is an effective method to deactivate the parasite. Water purifiers can be used to remove the parasite. For a water purifier to be effective in removing Cryptosporidium, it should be able to remove particles one micron or less. For more information on Cryptosporidium and a guide to selecting a water filter or purifier, visit the CDC’s website. Choose a method that will work best for you and your family. Cost, time of decontamination, ease of use, expiration date, existing health conditions, and taste of the treated water are all things to consider. Always read the fine print before purchasing a chemical treatment method. Iodine based treatment methods must be avoided by pregnant people and anyone with a thyroid condition. Prolonged use of these chemicals is usually not recommended. If you are concerned with the taste of treated water, you may consider including a taste enhancer in your preparedness kit (e.g. Kool-Aid, Tang, Emergen-C, etc.). By far, the least expensive method we tested was bleach. Chlorine bleach is inexpensive and widely available. A small container can purify a large amount of water. Bleach with added scents should not be used for water treatment. Opened containers of bleach can lose their effectiveness by off-gassing active ingredients. If you choose this method, you should have an unopened container in your preparedness kit. Treatment tabs are expensive and no more effective than bleach. Aquatabs® and Potable Aqua® were more expensive than bleach, with similar effectiveness. 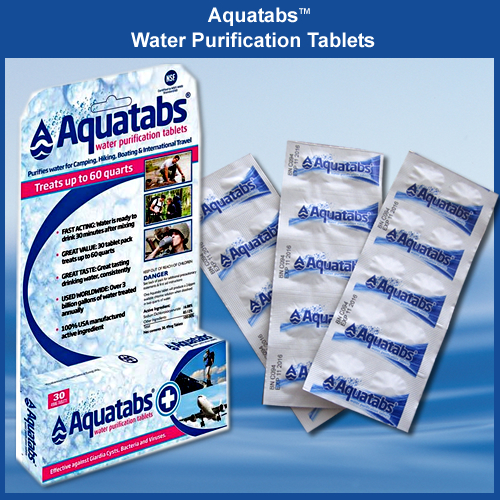 Depending on where you purchase these products, the cost to treat one gallon of water is approximately $0.67 for Aquatabs® and $1.83 for Potable Aqua®. The benefit of these tabs is that they are in a solid, user-friendly pill form, so they won’t leak or spill like liquids. Good water filters and purifiers are expensive. The difference between a water filter and a water purifier is the size of the microorganism it will remove. Water filters physically strain out protozoan cysts and bacteria. Water purifiers also combat viruses, which are too tiny for most filters to effectively catch. Our First Need® water purifier removed particles up to 0.4 micron, but it has a high initial cost. Good water purifiers can cost $100 or more (and some are much, much more) but they can purify hundreds of gallons of water with the same cartridge, making this method cheaper in the long run than the two brand-name methods. The downside to filters and purifiers is that they can clog if using murky water or if they are not cleaned/stored properly. If you choose this method for your family, it is important to research what the filter or purifier removes and learn about proper storage, handling, and cleaning to get the maximum life out of your device. For more info, check out REI’s guide called How to Choose a Water Filter or Purifier. For all items in an emergency preparedness kit, it is important to make sure that items have not expired, including water treatment methods. Some brands have effective dates within five years. Bleach containers that have been opened at least once should only be used for water treatment within one year due to off-gassing of active ingredients. Water filters and purifiers should be tested annually as well. 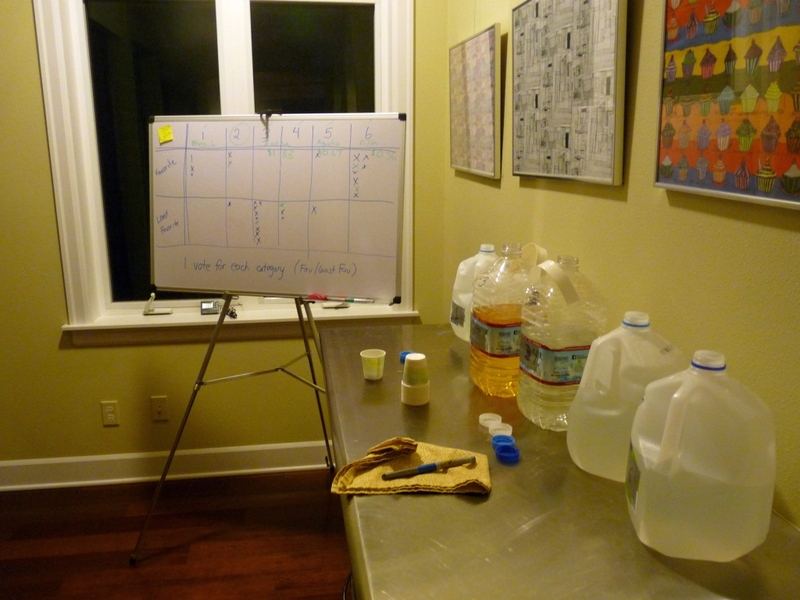 Not all water treatment methods will be the right choice for all situations. A household preparedness method might be different than the one in your car “go-kit.” Like all aspects of emergency preparedness, it is good to decide what is right for you. And it’s most important to plan ahead. –Written by Ingrid Larsson (Sunnyside NET Assistant Team Leader) and edited by Laura Hall (Arbor Lodge/Kenton NET Co-Team Leader). Technical input was provided by Sarah Messier of the Portland Water Bureau.